An increase in the the popularity of metal detectors helped boost the number of treasure finds last year. A total of 749 objects were reported found in 2007, according to the Treasure Annual Report. The report also includes all finds which have passed through the Treasure Process in 2005 and 2006. They include a gold Iron Age choker, valued at £360,000, which was found by a man searching for remains of crashed WWII aircraft in Nottinghamshire. The choker - the so-called Newark Torc - is the most expensive single piece of treasure found by a member of the public in over a decade. Made of a combination of gold and silver, it was was found by Maurice Richardson, a tree surgeon and metal detecting enthusiast, in 2005. 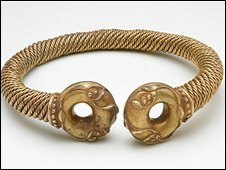 Although torcs have been found in the UK, most particularly in Norfolk, it is the first one to be discovered in the Nottinghamshire area. The hoard found in Snodland, Kent consists of more than 3,600 coins. 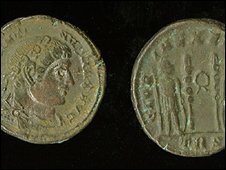 Other valuable objects unearthed by the public include a Roman hoard of more than 3,500 coins, while the oldest is a long, cigar-shaped piece of Bronze Age gold unearthed by a man out metal detecting near Winchester. Finders of treasure are now legally obliged to report discoveries which are over 300 years old. A number of museums across England and Wales have benefited from the increase in Treasure finds. Because of funding from organisations like the Art Fund and the National Heritage Memorial Fund, 282 of the finds from last year have been acquired by museums across the country.